The tropical creatures that they are, orchids grow best with at least 40% humidity. If you live in a cold climate and your home has central heating, maintaning 40% humidity levels can be a challenge in the winter. The problem is your furnace. As it heats the air, it's also baking out the moisture. 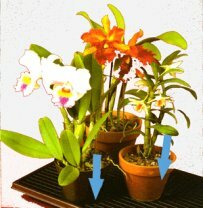 Growing healthy orchids in dry air is nearly impossible. If your humidity levels are less than 30%, you're going to have to make some improvements. I'll show you 5 ways to increase the humidity in your growing area below. 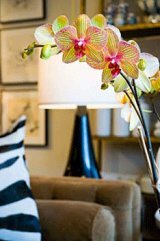 Both you and your orchids will be more comfortable during the winter winter with higher humidity levels in your home. Many orchids are comfortable with the same temperatures we live in. Humidity is another matter however. You can easily tell whether a room is hot or cold by simply standing in it. Understanding temperature and humidity from a plant's perspective can be quite different however. Temperature and humidity can vary a lot in a typical room. Most rooms have areas that get more or less sun, more or less heat, and more or less air-conditioning than the rest of the room. This is especially true near windows where plants grow. These small spaces are called "micro-climates". Conditions in micro-climates can be very different from the rest of the room. A good way to identify the humidity range in micro-climates is with a Hi/Lo Thermometer (also called a maximum/minimum thermometer). Our Hi/Lo Thermometers not only show the current temperature and humidity, they also record the highest and lowest levels over time. I use them regularly. Orchids need humidity! 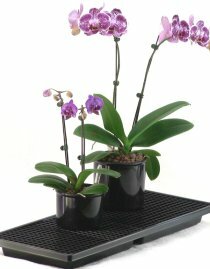 Humidity (moisture in the air) is a vital ingredient in growing healthy orchids. 40-70% relative humidity is ideal. To keep room temperatures comfortable in winter, central heating systems push out hot, dry air hour after hour. Maintaining 40% humidity under these conditions is impossible without help. Many homes in cold climates have humidity levels as low as 10-20% during winter months! Warning: Don't confuse humidity (moisture in the air) with water in the pot. Watering your plants more to compensate for dry air is another sure way to kill your orchids. On the other hand, plants tend to dry out faster when exposed to dry air. So some of your plants might require more water when humidity levels are low. With hydroponics this is easy because the water gauge tells you when to water - you don't have to guess. This is especially true for plants growing in hydroponics because the water in the pot is not only nurturing the plant, it's also evaporating into the air (right at the base of the plant), raising humidity levels. Warning #2: Never add water to the pot to increase humidity! 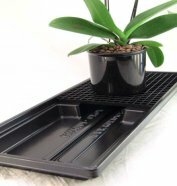 With traditional growing methods, Humidity Trays are hard to keep clean because they collect runoff water (and nutrients) that have passed through the plant from watering. Humidity Trays collects a multitude of chemicals from the water that has passed through the plants. In a sunny window, this water grows mold, algae, and a host of other things. Yuk!! Cleaning the tray becomes a weekly task. Our Hydroponic System Gives You the "Clean and Green Growing Environment" You're Looking For! With hydroponics, the plants sitting on the tray are growing in a "closed watering system". The outer pot holds the nutrient solution for the plant, and it's watertight. No water from the plant drains into the humidity tray. Chemicals from the plant never reach the water the tray, so keeping it clean is a breeze. The water in the tray is seperate from the water you use to water your plants. Simply add a drop or two of bleach (per gallon) to the water used in your Humidity Tray and you'll eliminate the mold and algae, (and other things) that usually grow there with traditional growing methods. Breathe easy - you're growing in a clean and green environment. With traditional growing methods, humidity trays collect the water (with plant food) that passes through the grow pot. This water grows mold and algae when exposed to light. With Hydroponics everything stays clean because water (and nutrients) from the plants never reaches the tray. Humidity levels are closely tied to air temperature. 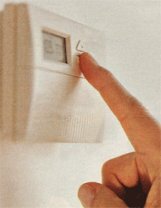 To promote higher humidity during winter months, try turning down the thermostat a few degrees, especially at night. Both you and your plants will be healthier! Orchids embrace cooler temperatures instead of the hot, dry air from the furnace. Using humdity trays and a room humidifier and lowering the temperatures at night is by far the best solution to low humidity. And that's good news for both you and your orchids. 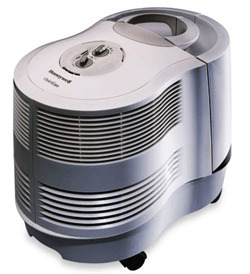 Room humdifiers are a good solution for dry air in your growing area.